With apologies to the possum that holes up behind the bird food barrels each winter, of all the critters that visit the BugLady’s front porch, the fishfly is her favorite (Mom really does like you best). The first thing you notice when you Google “Fishfly” is that there are lots of hits for mayflies. 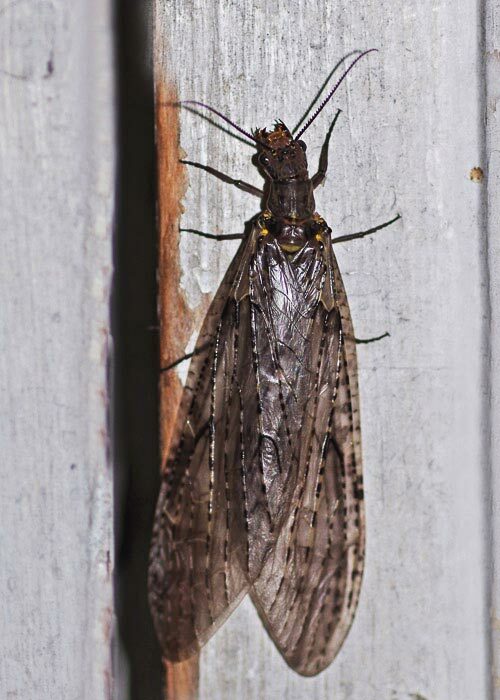 Mayflies (order Ephemerata) are a different beast altogether, one that gets our attention when they emerge (any day now) in uncountable numbers for a brief but dramatic flight period, causing river and lake-side communities to mobilize municipal snowplows to clear the streets and bridges of dead and dying mayflies. 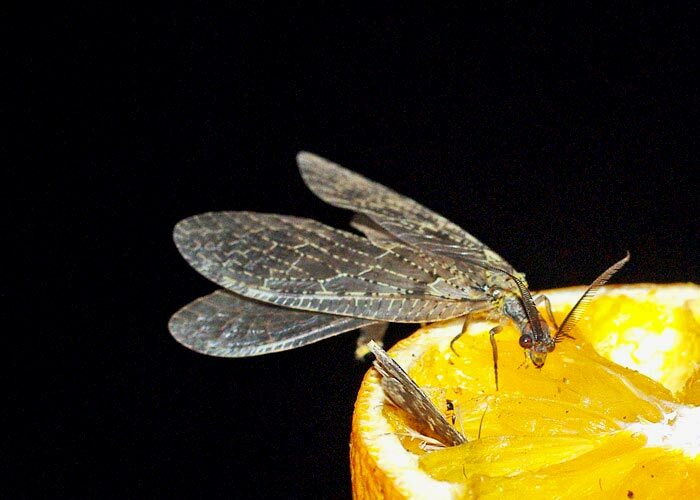 Mayflies are wholesome fish food both as aquatic larvae and aerial adults; fish grab them in the water column as they float to the surface and from below as they rest on the surface after emerging (a fact that has not escaped the notice of fly-tiers). The star of today’s BOTW is the other fishfly. Fishflies can be found throughout much of eastern North America. 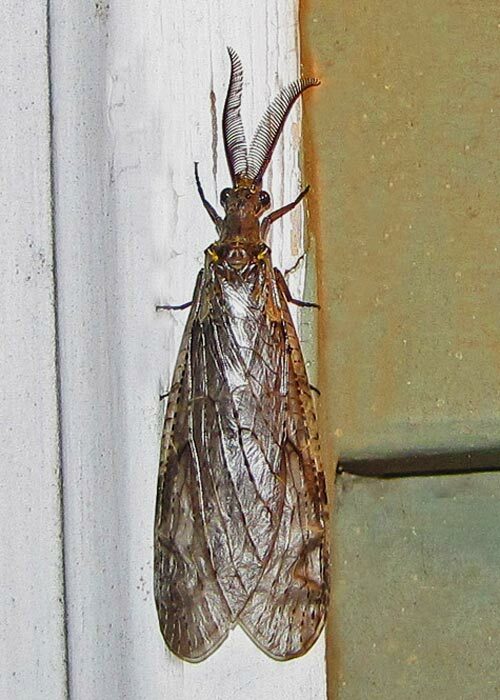 Adults are generally found near the water that their aquatic larvae require (which is why the landlocked BugLady is always surprised to find them on her porch). Various species of Fishflies may live in streams and rivers or in still ponds; some, reported from ephemeral ponds or streams, can survive a short dry spell if well-buried in wet mud. They have also (uncommonly) been found in tree holes and in the pitchers of Purple pitcher plants. Megalopterans tend to be soft-bodied, nocturnal, awkward fliers. They might possibly be mistaken for a dragonfly in flight, but never at rest. 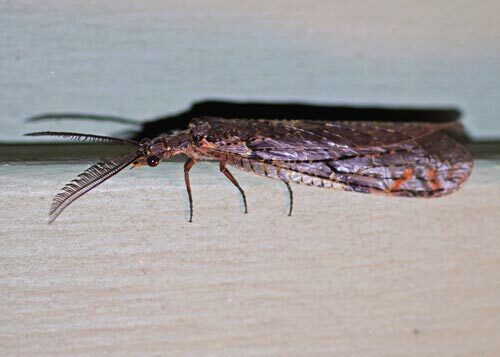 Male Fishflies lack the impressive, pincer-like mandibles of their fierce-looking, five-inch-long Dobsonfly cousins, although at two inches in length, FFs are no slouch. Male FFs have feathery (pectinate) antennae (females of some species signal their whereabouts with pheromones for him to sense and follow), and the females’ serrate antennae have short, comb-like teeth along one side. 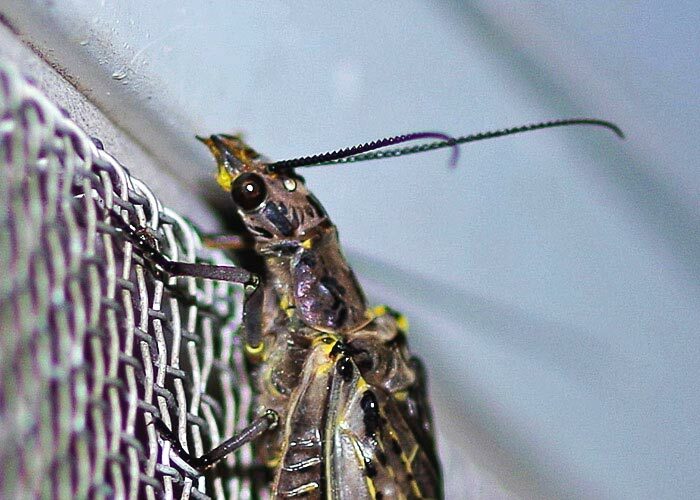 The larvae of both dobsonflies and fishflies are called hellgrammites, and are, famously, sold to fisher-people as bait (the BugLady always pictures the hellgrammite swimming over and grabbing the fish in its “teeth”). Fishflies practice complete metamorphosis, hatching from eggs, living as larvae, resting and changing as pupae, and emerging as adults. Like many (but not all) of the insects that develop this way, their appearance, habitat and diet changes radically in their different life stages. Eggs (up to 3,000 of them) are laid nocturnally above or near the water—glued together in damp spots like semi-submerged rocks or on twigs and the undersides of leaves directly above a pond or stream. When the young hatch (nocturnally) they drop/crawl into the water. 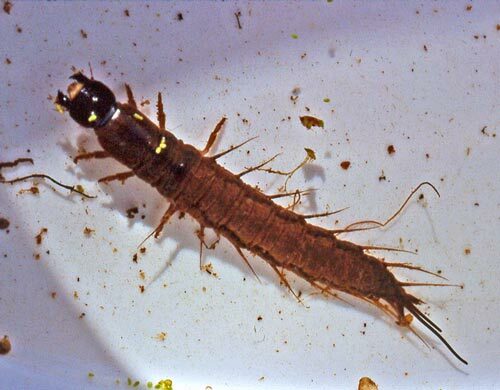 Fishfly larvae are creatures of the benthos, the bottom debris of a pond or river; there they live in the muck or under logs, etc. The writers who describe them as “worm-like” must live on a very different landscape than the BugLady does. Hellgrammites are thick and somewhat flattened, dark brown and shiny, with an impressive head at one end, six legs in the middle, and seven or eight finger-like filaments along each side of the abdomen. The filaments are gills, one of the Fishflies breathing strategies. On land (on their post-hatching trek to water or their pre-pupal hike away from it), they breathe through spiracles like terrestrial insects (of course, they don’t open their spiracles underwater). When submerged, they can absorb, through their soft skin, oxygen that is present in the water, but they also breathe through those external gill filaments when oxygen is low. In addition, species that live in still waters have two, long, contractile respiratory tubes at their nether ends; with the tips of the tubes poked up above the water surface, they can take in oxygen from our atmosphere. FF larvae don’t move fast, but their bite can be memorable. Hellgrammites are primarily carnivores, using their chewing mouthparts on minnows, tadpoles, and soft-bodied aquatic insects like mayflies, caddisflies and fly larvae. Some sources list them as scavengers, omnivores and detritivores (animals that feed on detritus—decomposing plant and animal matter). Their ordinary mode of locomotion is by crawling along weeds and the debris of various kinds that gathers at the bottoms of ponds, but when alarmed they can swim rapidly by suddenly doubling the body up, bringing the head in contact with the abdomen, by which they are propelled some distance through the water… When handled, the Chaiuloides larvae occasionally eject from the mouth a considerable quantity of a blackish fluid, reminding one of a similar habit of certain locusts (Acrididae). 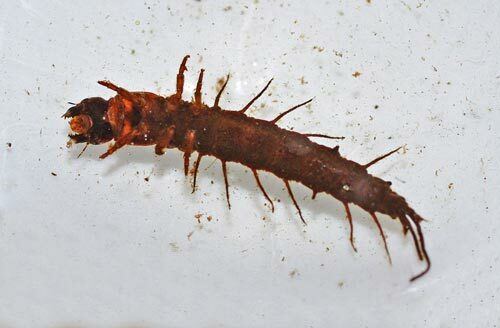 These larvae have also a peculiar habit of walking on the surface of the water, body downward. They can move along in this manner quite rapidly. Despite their inclusion in that worthy publication, they are not considered pests. When, after one to three years (larvae in warmer climes mature more quickly), the hellgrammites are ready to pupate, they do it in synchrony with others in their age class. Within a few days, the whole cohort abandons the water, in a sometimes-dramatic migration, to pupate on land. They pupate underground or in rotting wood in spaces/cells that they excavate. Fishfly pupae resemble the adults they will become, and for pupae, can be pretty active, moving around when disturbed. In his excellent, J. Reese Voshell, Jr. notes that vibrations caused by thunder storms may stimulate the exodus of mature hellgrammites that are ready to pupate! The short-lived adults gather rosebuds while they may. Accounts say that adults are around for a week or so and do not feed; or that males do not feed, or that they sometimes come in to sugar bait in moth traps. And, apparently, to the oranges the BugLady puts out for birds. BugFans who are practicing for the next big spelling bee should remember that in entomological usage, if you are spelling a true fly (horse, deer, flower, cluster, blue-bottle, etc. ), the words are separate—robber fly. The other “flies”—butter, dragon, damsel, May, scorpion, fire, caddis, stone, saw, etc.—are spelled as one word.